A link to the "German Sun" Bild? Nobody here, except zippy and me understands German . Don't get me wrong, I really appreciate any posts here in the Bundesliga thread but only posting a link to a (German) newspaper? I would rather read your opinion. Hoffenheim vs Frankfurt 1-2. After their great 4-1 win against Lazio in the Europa League they are coming in the Bundesliga too. Hoffenheim? Wow, seems that Nagelsmann has some problems to solve. The players know he'll leave next season, maybe one reason? Its the BBC rumours section I think so it has all sorts of rumours. Will Bayern really get rid of Kovac already? You never know but I don't think so. Bayern President Uli Hoeneß actually said that this is a "non-discussion" and that they are totally calm at Bayern. But you know how it is with such remarks. If they still lose after the international break this means nothing then. 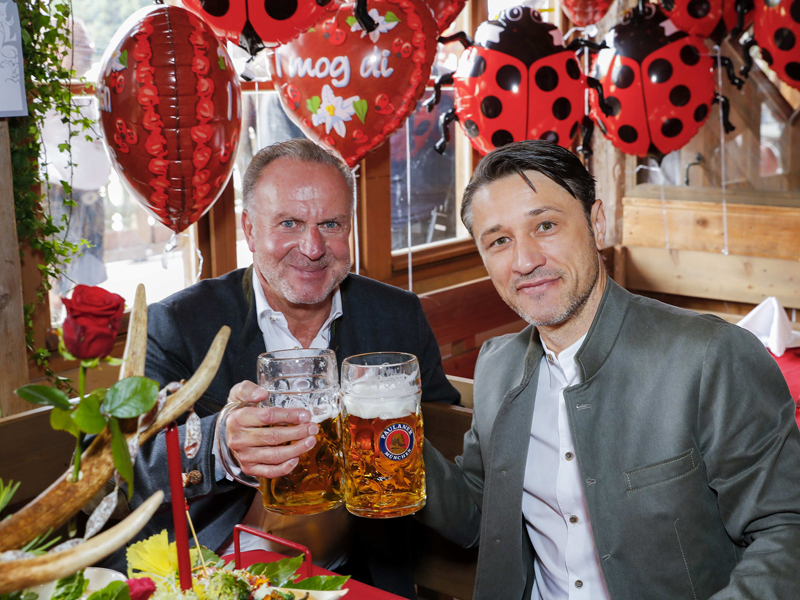 Today's visit at the "Wiesn" (Oktoberfest), Bayern Chairman Karl Heinz Rummenigge and Niko Kovac . Normally Bayern don't sack coaches during the Oktoberfest (until last year when they sacked Ancelotti just at that time ). But normally Bayern don't lose during the Oktoberfest either. Admittedly not fluently but I can usually read pretty well. Shame Augsburg couldn't hold on against Dortmund. Given them and Bayern Munich a good game in the last couple of weeks. Same here, I can speak a wee bit of German etc as I was stationed in Dortmund during my army days, I must admit not as much as I could around the 70's and I always keep my eye out and check on Borussia Dortmund's matches and news and have them down as one of my favourite teams. Oh ja, Entschuldigung! Habe ich total vergessen, daß du Deutsch lernst. Yes, they played really good in both matches and were very unlucky to lose the Dortmund match. Btw: It seems that at Augsburg ,former HSV players are flourishing again. Last season Michael Gregoritsch and now Andre Hahn, who was pretty useless at HSV but now, back at Augsburg, he seems to regain his form. My "2nd love" Eintracht Braunschweig, actually bottom of 3.Liga (makes my heart bleeding) has sacked coach Petersen and replaced him with Andre Schubert, former St.Pauli and especially Gladbach coach. This is a good move and I really like this guy. Good to see him back . And, not to forget: Torsten Lieberknecht, former Eintracht Braunschweig coach for many years and sacked after the relegation to 3.Liga (and replaced by the now sacked coach Petersen) has another job, too at 2.Bundesliga bottom placed MSV Duisburg (nicknamed: Zebras). They were winless and right in his first match they won away at Köln. That's football ! Delighted for Reiss Nelson. All 4 of his goals have been top draw finishes too. Oh **** it. They'll never learn, the arseholes in HSV management. New coach is Hannes Wolf, sacked last year at Stuttgart, after being their "hero" bringing them back to the Bundesliga. He's not a bad man and I like him but these arseholes in the management really make me angry. This goes on now for nearly a decade. I am tempted to throw my season ticket in the bin ( I was tempted to do this many times in the last 25 years but never done it though ). Can't remember the last time I saw Bayern drop points so frequently, because the only thing I have been watching recently is their boringboringboring dominance. Just hope Dortmund can keep their good form going for a longer period. I know Klopp's side from few years ago would have been feared by any today's team in Germany, including Bayern. Are these guys good enough for something similar? Last season in the first 9 matches it was nearly the same. Dortmund ahead and Bayern dropping points. Then they sacked Ancelotti and from matchday 10 they were on top again and never gave the lead away. So a few here feared this would happen again on this actual 10th matchday. Tbh I laughed out loud when I saw the matchday summaries of the Bundesliga yesterday evening and when Bayern got the 1-1 in the 89th minute. Normally it's their turn to score a lucky goal at the end of the match or stoppage time. Dortmund looks fantastic so far but you always have the feeling that the bubble bursts (like last season under Coach Bosz) at one point. Hopefully not because most football fans here in Germany are happy about the actual situation (except Bayern fans, of course). But it's early days in the season, 10 out of 34 matchdays. Hopefully BVB keep it interesting for longer. Always liked their football and fans as well. Their current manager has good previous Bundesliga experience doesn't he? Familiar face, think I saw him in the other Borussia few years back. Yes, Lucien Favre, a Swiss, is very familiar with the Bundesliga. He coached Hertha BSC Berlin from 2007-2009 and (the other) Borussia (Mönchengladbach) from 2011-2015. He was even voted 2-times Coach of the year in the Bundesliga. At Berlin he was sacked in 2009 after 6 losses in a row at the start of the season. At Gladbach, he brought them their first appearance in the top European competition for decades. In 2015 he resigned after 6 losses at the start of the 2015/16 season (yeah, again 6 losses). He then moved to Ligue 1 OGC Nice and now back to the Bundesliga. So, Favre brings immediate success but not in the long run (so far). btw: Reiss Nelson again with a goal at Hoffenheims 4-1 in Leverkusen. This guy has already scored 5 Goals in 6 Bundesliga matches. DarkMagician and Donnyrovers90 like this. These are very likeable guys with a high work ethic, something that we love here. Still a bit of disbelief that Borussia Dortmund could catch Jadon Sancho, not only on loan but on a permanent contract (which was only 3 years last year when as a 17 year old, due to UEFA rules, he couldn't sign for a longer term. But as soon as he was 18 Borussia extended the contract to 5 years now). I bet Hoffenheim would like to do the same with Reiss Nelson but Arsenal won't do that. Leipzig wanted to extend the loan for Lookman too because he convinced them during his stay but he was ordered back. HSV back on top after yesterdays 1-0 win against #1 Köln (they are now only #3 because St.Pauli is now on #2. 2 Hamburg Clubs on top of the (2nd) Bundesliga. That's strange! btw: Hannes Wolf is the first HSV coach ever in the long history of the club who started with 3 Wins with no goals conceded. Not even the great Ernst Happel reached this feature. Thoughts on upcoming Der Klassiker, Dirk? Dortmund should be taken very seriously if they pull it off. But as always these days, I am not confident in anyone who is up against Bayern in Bundesliga. I am hoping that the 4 pts gap between Dortmund and Bayern will stand after the match (or is even widened to 7 pts). Would be nice too if Borussia could play their attractive attacking style (like in their best times under Klopp) but tbh I doubt it. Last tuesday they got their first setback with the 0-2 loss at Atletico Madrid in the CL and nothing to see about it. OK, it wasn't expected that they'll hammer Atletico like the 4-0 match in the 1st leg two weeks ago but nonetheless this was a disappointing performance (although they are still on #1 in the group). Borussia lost the last 3 league matches against Bayern (last season even with an 0-6). It will be the 99th match between those two since the Bundesliga started in 1963.